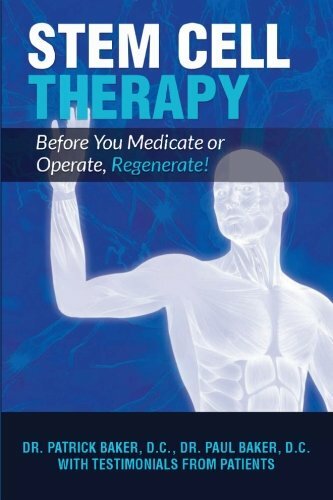 Stem Cell Therapy: Before You Medicate or Operate, Regenerate! There is a revolution underway with how people are treating and eliminating their pain and discomfort. It’s called Stem Cell Therapy and what it’s able to do is nothing short of miraculous. The ability to restore perfect functions to a body party as if it were new is not a fantasy; it’s real. It doesn’t matter how scarred the tissue, how damaged the joint, or how severe the trauma, Stem Cell Therapy offers answers, and the opportunity to bring your body back to normal! This book will introduce you to Stem Cell Therapy, explain the wonders of regenerative health care, and demonstrate how it has improved the lives of people who came to us looking for solutions and found them.